It’s rare to find the quality of life afforded to those who live in North Vancouver. Located just 10 minutes away from Vancouver proper, residents of the North Shore enjoy beautiful Canadian landscapes while maintaining easy access to modern amenities and good transit. The recreation at your doorstep in almost every pocket of North Van is one of the things that makes it uniquely wonderful – the picture of Canadian living. Stroll around most any neighborhood to find woodsy trails, waterfront paths, canyon hikes, and savvy cyclist routes. Known for its tight-knit communities and excellent schools, North Van garners interest from a wide market of young professionals, families, retirees and sporty internationals. Most of the area is characterized by larger single-family lots on quiet streets, sprawling older townhomes, affordable leaseholds, and the rise of newer apartments. 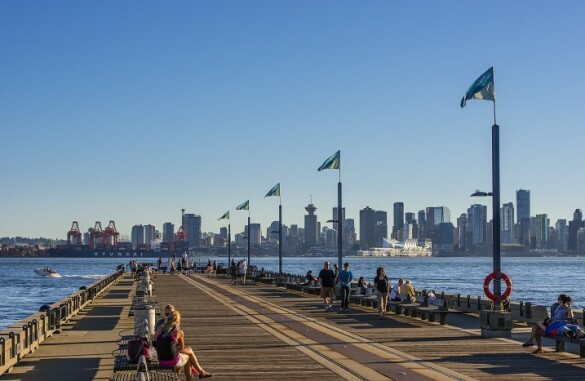 Densely populated areas around Lonsdale Quay offer a vibrant, convenient lifestyle just a short and adorable sea-bus ride away from downtown. With so much to do outside surrounded in rushing river waters and misty rainforests, there is a healthy vibe going on all over North Van – and we like it! $1,365,000 One Percent Realty Ltd.